When Lucifer thinks that he is the only one of his kind and might, and steals the Wife of the most loving Husband, he commits a big mistake. He has awakened the anger of a devil guised as a good looking man upon earth who loves his wife and can go beyond any limits to bring her back to life. She cannot be taken, her breaths belong to him, he is the owner of her flesh, skin and everything of her. A massacre, incessant bloodshed takes place within the heavens and he reminds the gods that they have created him but he lives by his own rules and loves most ferociously. All this is witnessed for the first time by his Wife, the woman who is deeply in love with her possessive lover and she has accounted all her love and feelings through her poems and musings after coming back from the confines of the skies and heavens. With this new truth that her husband is another Devil guised as a man, she loves him even more now. She sees him as her “God” knowing that none has the heart to love her, protect her and comfort her like he does. Yes! She is all pompous that she is the “Devil’s Wife”. The poet’s first book in poetry with the title Stirring Spoonful of Emotions was published in 2014 by Cyberwit Publishers. Her second poetry book Terracotta Dreams has been published in the year 2018 by Wordit Content Design & Editing Services (Become Shakespeare). Some of her poetry has also appeared in literary magazines like Ink Drift, Quillopia, Kalaage and Verse of Silence. Her name has also been recognized among the top fifty winners for Times India Write Contest Season 2, under the prompt given by the author AnanadNeelakantan of Bahubali fame. She is also the founder and editor-in-chief of an online magazine called Plethora Blogazine. 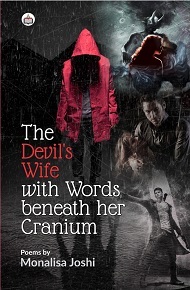 The Devil’s Wife with Words beneath her Cranium is her third poetry book.